My parents – who stay with us each summer – are about to return to Florida, and my dad absolutely loves Moscow Mules. I have to admit, I’d never tried one before he got into them, and if you’ve never either you really should. 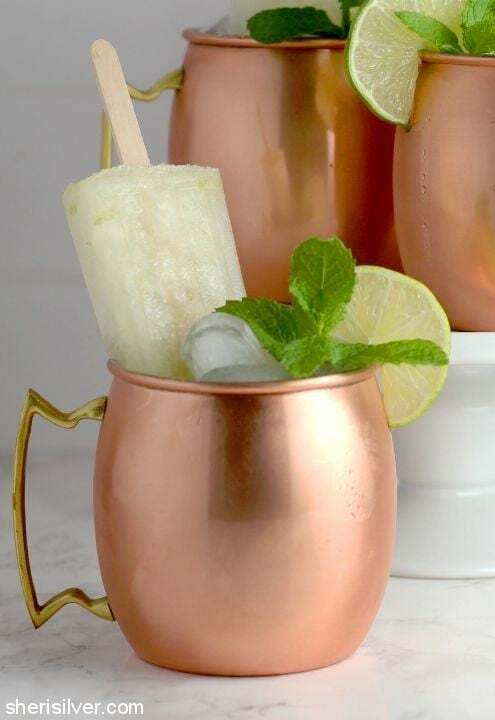 So what is a Moscow Mule? It’s a classic cocktail made with vodka, ginger beer and lime juice. It’s traditionally served in a copper mug and garnished with a wedge of lime (read this article in Liquor.com for more history). 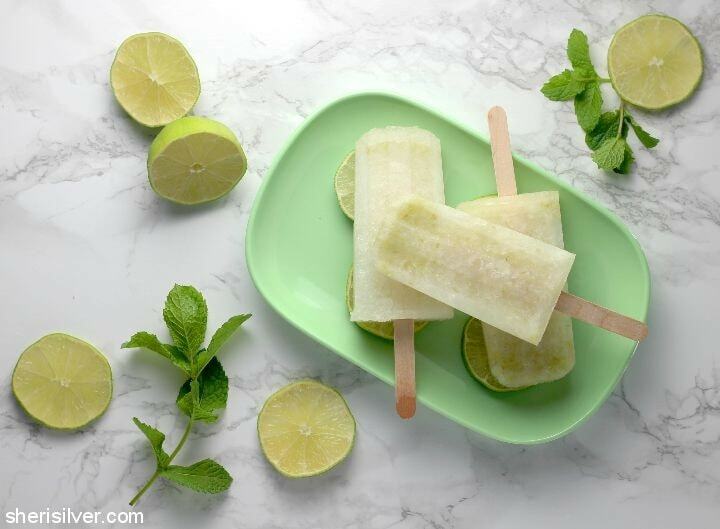 It is super light, refreshing and flavorful, and I just knew it would make for a perfect popsicle! But I wanted to step it up a bit. To start, I wanted the pop to be a little sweeter than the cocktail, so I decided to make a simple syrup. But I didn’t stop there, and infused the syrup with some freshly sliced ginger (which I always have on hand, thanks to this tip). I also added some lime zest along with the juice, for color and even more flavor. And here we have them! The ginger beer adds a nice effervescence, which you don’t typically experience in a popsicle. And my dad loved them. Make the simple syrup: Bring the water and sugar to a boil in a small saucepan, stirring until the sugar is dissolved. Remove from heat, add the ginger and cover. Cool to room temperature; strain and discard the ginger (refrigerate if not using right away). 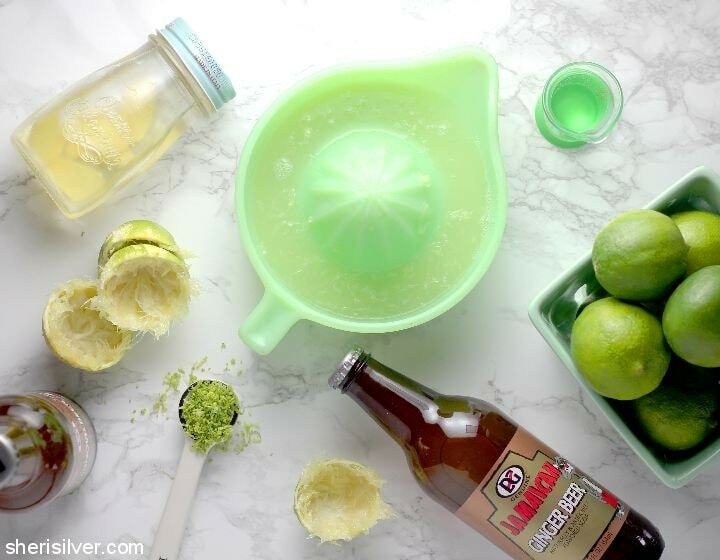 Pour the lime juice and zest, vodka and ginger beer into a spouted cup. Add 2 tablespoons of the simple syrup and stir. Taste and add more syrup if desired. Pour into your popsicle molds and freeze for 1 hour, or till slushy. Use a thin knife or skewer to distribute the zest, add your popsicle sticks and freeze overnight. Note: any leftover simple syrup may be kept in the fridge and used to sweeten lemonade, iced tea or cocktails! Get all of my popsicle recipes on my Pinterest page! Yummm. Love Moscow Mules…also, thanks to Mel. 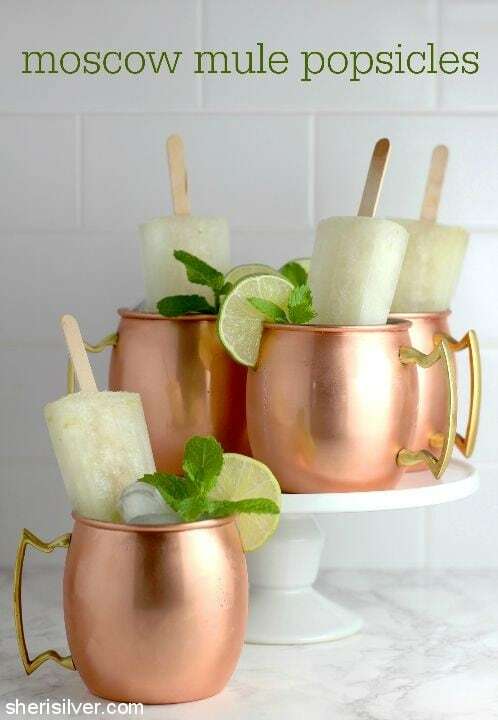 Mel’s Moscow Mules! !